Its only been a few hours since Google spilled the beans on their upcoming Chrome OS, and now we already have a fully working VMware image of Chrome OS ready for download. All you need is a system running Windows, Linux or OS X with VMware installed and you are good to go. For those of you who don’t know, Google in an event yesterday, demonstrated the lightweight and open source operating system called Chrome OS for the first time. 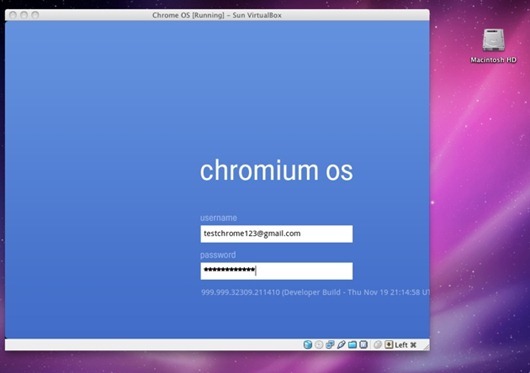 Chrome OS is designed for netbook PCs and runs on top of a Linux kernel. Consumers won’t be able to download and install Chrome OS on just about any system they like. It will be available next year only through OEMs channel and on the hardware that meets Google’s specifications. But since the source code is available for free download, anyone can go ahead and compile the code now to test out the cloud-based OS before its availability in late 2010. UPDATE 1: Follow the complete step-by-step guide posted here on How-to install Chrome OS in Windows 7. Yes, NOW you tell me this… I have spent the past number of hours building it from the source! I hope we can get ahold of copies that will run on our own hardware when it's released! Google, don't start being like apple! That's probably one of the reasons Google want to restrict it to certain hardware. They're not interested in a full fledged OS with all that entails. They just want to take over our lives with as little effort as possible (cynically speaking), not create an alternative to Ubuntu. Download link not WORK .